Monday June 1st 1907 I did washing this morning with Billys help. he mowed the yard. Will did not feel well all day but plowed corn in afternoon. Billy finished the Woolf field for the 3rd time. I was in town in afternoon I got medicine for myself and Will. Did evening work. Tuesday July 2 1907 I baked bread and ironed before noon. Will did not feel very well. Billy finished plowing the corn on our farm for the 3rd time. I was busy with sewing in afternoon Was late with the evening work got the last of the straw-berries for dinner tomorrow. 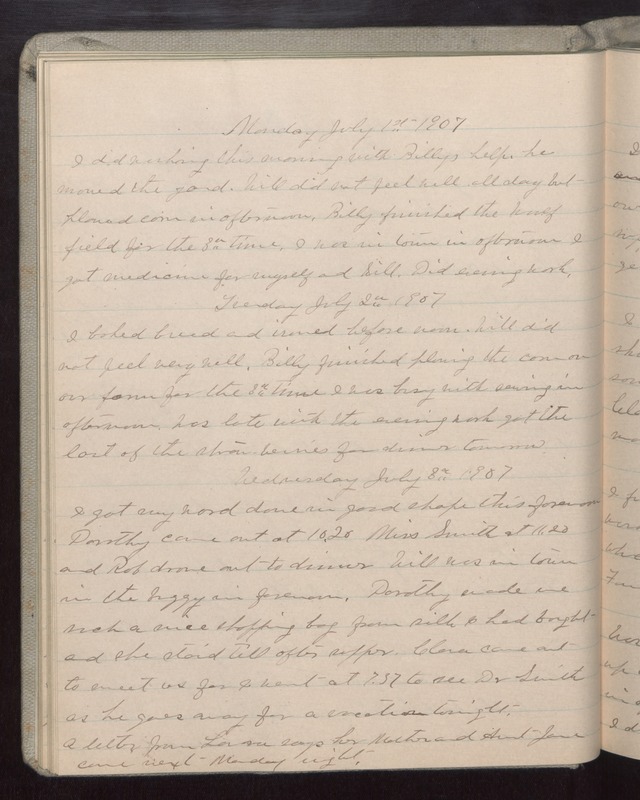 Wednesday July 3 1907 I got my [word?] done in good shape this forenoon. Dorothy came out at 10.20 Miss Smith at 11.20 and Rob drove out to dinner. Will was in town in the buggy in forenoon. Dorothy made me such a nice shopping bag from silk & had brought and she staid till after supper. Clara came out to meet us [for?] I went at 7.37 to see Dr Smith as he goes away for a vacation tonight. A letter from [Louisa?] says her Mother and Aunt Jane come next Monday night.